On 01/18/19, at approximately 0230 hours, Sheriff’s Dispatch received a call from a concerned citizen reference suspicious circumstances having just occurred in the area of Metro PCS in Camarillo. The citizen reported a suspicious person running from the area and had possibly broken a window to the business. 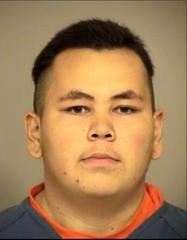 Patrol units responded to the area and learned a subject later identified as Junior Martinez had broken into the business, stole merchandise, and fled the area. Martinez was identified through video surveillance and his description was broadcast. At approximately 0300 hours, Sheriff’s Dispatch received an alarm call from JR Market and Liquor. Patrol units responded to the area and learned the front door window had been smashed. While investigating this incident, Martinez was contacted nearby before attempting to flee the area. Patrol units quickly took him into custody. Further investigation at JR Market and Liquor revealed Martinez had shattered the business window with a rock, stole merchandise, and fled the area. Martinez was arrested for a violation of Penal Code Section 459 / Burglary, of the two businesses. Deputies conducted a background check on Martinez and learned he had recently been released from jail on his own recognizance (O.R.) with court ordered probation terms on 01/04/19. Martinez had served 6 days in custody for a similar arrest. Part of his probation terms was that he had to stay away from JR Market and Liquor. During the above mentioned arrest on 12/29/18, Martinez was contacted by law enforcement in the area of JR Market and Liquor in possession of burglary tools. During this contact, Martinez admitted he intended to burglarize the business by smashing the window and had done so earlier in the year. Camarillo Detectives later confirmed his statements. The Camarillo Police Department would like to thank the concerned citizens who report suspicious circumstances throughout the City of Camarillo. We encourage you to continue assisting law enforcement in bringing criminals in our community to justice. Join us in the fight on crime by following us on Twitter @VENTURASHERIFF, Facebook, Instagram @VCSHERIFF and with Nixle by texting your zip code to 888777 to receive local law enforcement and public safety alerts and advisories.